When Lead Fiskateer Cheryl Waters asked me to create a tag challenge for the Mixed Media Madness event, my mind immediately went to mist. At the beginning of 2012, I declared Glimmer Mist to be my favorite product of 2011. Mists are really versatile and so much fun. Here's the tag I created, using mist four different ways. Punch a piece of scrap cardstock with a border punch (I used Fiskars Scalloped Sentiment) to create a stencil. Place it over the tag, then spray with the lightest mist color. Move the stencil and spray with the next darkest color. Continue 1-3 more times, finishing with the darkest color. Stamp an image and emboss. I used Versamark ink and clear embossing powder on chipboard. Spray over the embossed image and immediately wipe with a tissue. Stamp an image and emboss. Spray mist onto a non-stick surface (I use the outside of a used sandwich bag.) or simply remove the cap from the mist. Use a small paintbrush to paint directly on the non-embossed parts of the image. Place scraps of white ribbon into a ziplock bag. 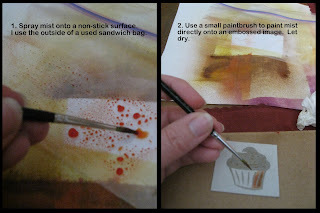 Spray a small amount of mist into the bag, seal, and massage to spread color evenly. Remove the ribbon from the bag and lay it on a flat surface to dry (I use the inside of a cardboard box). My challenge asked participants to use at least two of these four techniques on their tags. The results were awesome! Happy anniversary to my wonderful husband Steve. He is kind, smart, supportive, generous, romantic and everything else you could ask for in a spouse. Here we are, eight years ago today. It's always fun to look back at older layouts. I have no idea why I used all that green since our wedding colors were tangerine, hot pink and purple (aka Tangerine Tango, Cabaret, and Bellflower). Oh well. Despite the green, I love this layout because I included each of our vows, written out in our own handwriting. Steve has terrible handwriting and absolutely hates writing, so it shows how much he loves me that he was willing to sit down and painstakingly write out his vows to be preserved forever in the scrapbook. Happy anniversary Steve! Thank you for eight wonderful years. Two weeks ago, I blogged about a Creating Keepsakes article on how to get published. 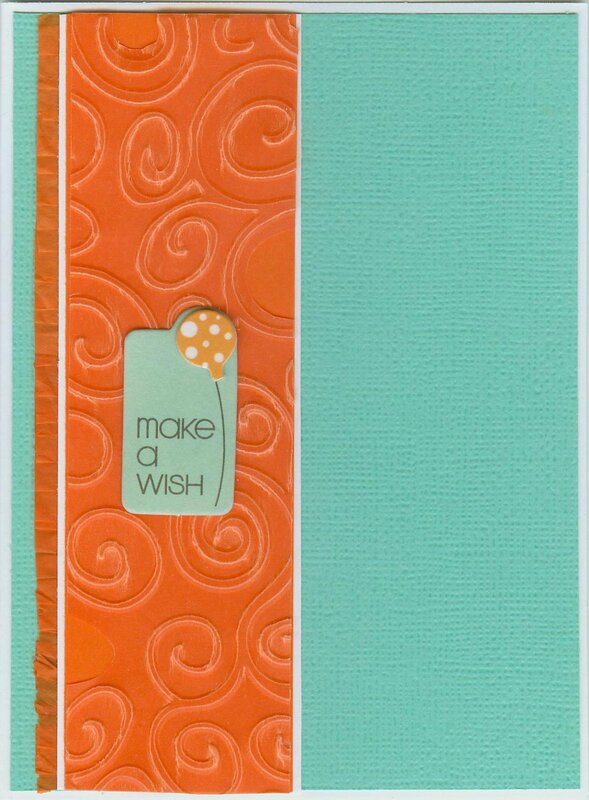 Creating Keepsakes also has a "Tips for Getting Pages Published" article on their website. While some of the tips are the same for both, there are some differences as well. Here's another page I submitted for publication that was not accepted. 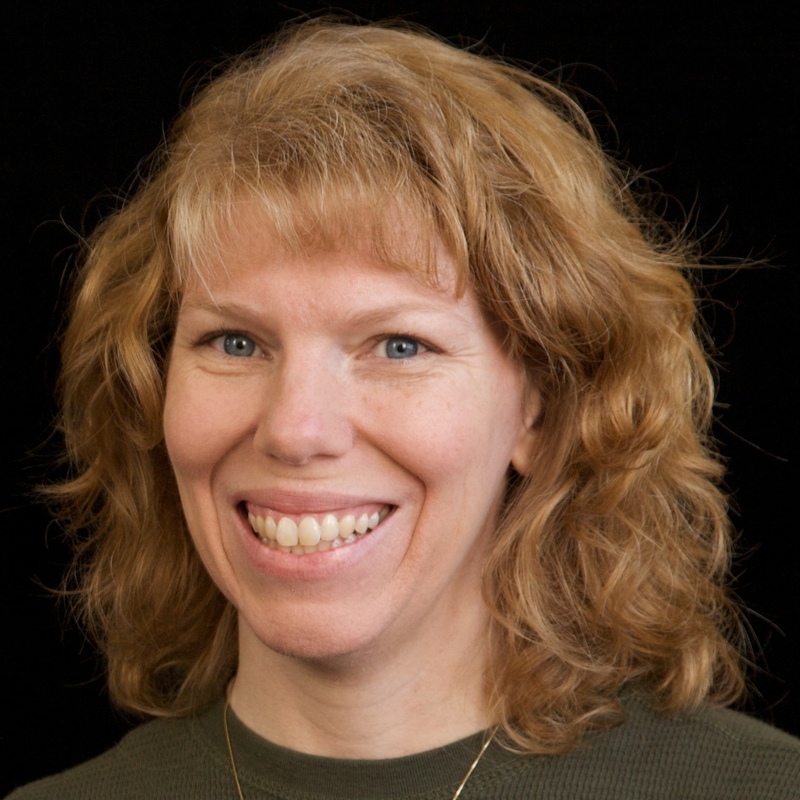 Use color photographs.... Do we publish layouts with black and white photos? Yes. Yet we frequently ask contributors to replace b/w pics with color ones. Use multiple photographs on a page.... Many of our readers like to get more on a page, so we try to show you how to do that effectively. Check... sort of. Two photos isn't exactly what I think of when I think of multiple photo layouts. Include journaling... The date, the occasion, the emotions the photo(s) evoke-something is always better than nothing. Check! Plenty of journaling on this layout. Keep it fresh.... You don't have to use the newest products, as long as how you showcase them is interesting. However we are looking for pages that don't look outdated. While old paper is perfect for a scrapbook, we tend to focus on new and fashion-forward looks, which usually means using the latest products. HONK. While these products are neutral and thus don't look outdated, they aren't new and I don't think they're used in a fashion-forward way. Be yourself. Know the trends, but make them your own. HONK. I do make two-pagers, but this isn't one of them. HONK. This is probably the number one thing that causes magazines to reject my layouts. I have very nice writing and it is legible at full size, but it can't be read at the size a magazine would print it. As much as I would love to be published, I'm not willing to write less and/or artificially large. Utilize good design principles. We examine layouts carefully for unity, balance, color sense, etc. Check! There could be a bit more interest to break up the strong horizontal, but in general the layout shows good use of design principles. Check! If anything, I might need to use more embellishments. Choose the best photographs. We tend not to be drawn to layouts that have several different pictures from the same occasion of the same person in slightly different shots. Check... halfway. These are great pictures, but they show the same person in slightly different shots. I don't usually do that (and shouldn't have done it here if I was serious about wanting the page published), but the expression on his face in the two pictures is so different and part of the story I wanted to tell. HONK. No "it" factor here. I think it's an attractive, well-done layout, but it doesn't feature any unusual techniques, colors or embellishments. Inspire us. We're scrapbookers, too. Make us wish we had thought of it first! HONK. There's nothing special about this layout. It's well-balanced, attractive and easy to scraplift, but it would be a stretch to call it inspirational. Going through the checklist it is readily apparent why this layout wasn't picked up for publication. No matter- I love it, and of course that is what matters most. Have you ever sat down to create something, made a mistake, brainstormed a solution, and ended up with something even better? That happened to me twice this past week during the Fiskateers Spring Stamp Out! Interestingly, the two challenges were "Color Me Vibrant" (use only bright colors) and "In Black and White" (no colors at all). Completely opposite challenges! A moment of silence for .05 and .005. I will miss them. I decided not to kill any more pens, which forced me in a different direction. I punched the star, added the sentiment in black, stamped the whole thing with Versamark, then chalked over that. A million times faster and easier with no ruined supplies. Lesson learned! I got a fun new wedding-themed stamp set from Layers of Color, so I decided to break it in for the "In Black and White" challenge. First, I experimented with two embossing powders. I stamped the image on the left with Versamark ink and then used black embossing powder. For the image on the right, I used black ink and clear embossing powder. It was fun to see the difference. They both look fine, but I thought the one on the right was more crisp and beautiful. I matted it, then set it aside to do some background stamping. 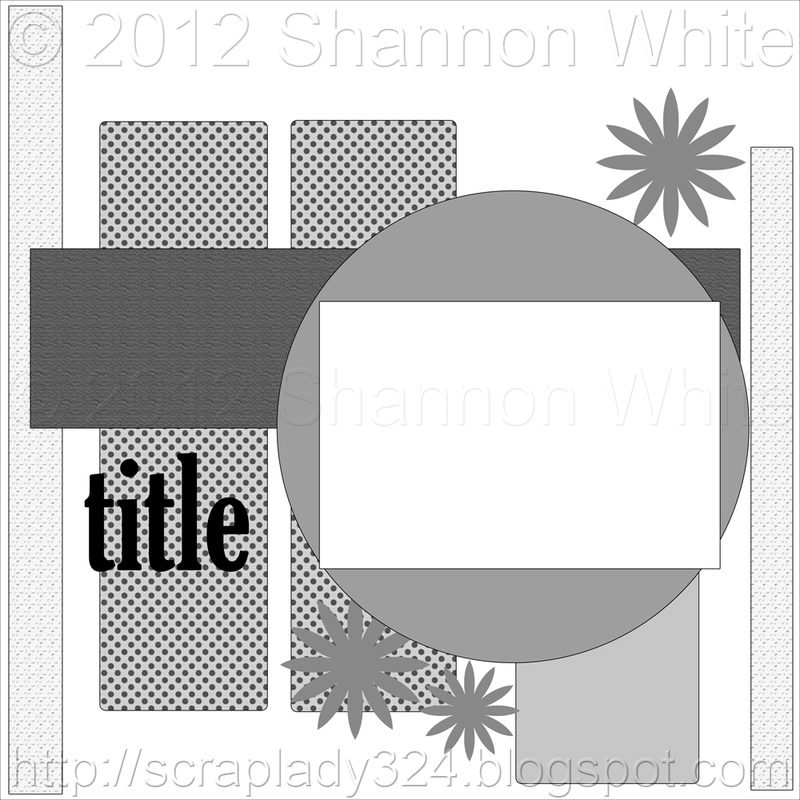 When I was happy with the background, I picked up the embossed image and layered it on top. What the heck is that smudge doing there?! Rookie stamping mistake- not checking for inky fingers. Aargh! I was pretty annoyed at myself... until I realized the mistake was an opportunity. I dug through my goodies and found a bit of Prima sparkly black ribbon left over from the Flamingo Four challenge last June! It was perfect! I added a piece of Fancy Pants filter paper as the final touch. Beautiful! The card looks much better with those two embellishments and I would never have thought to use them if I hadn't made that unsightly thumbprint. Definitely a happy mistake! Today I'm sharing more stamping projects from the Fiskateer Spring Stamp Out. As you probably know, Fiskars is famous for their orange-handled scissors, so we Fiskateers are frequently challenged to pair orange with another color. In this case, we were asked to pair orange with a color that (allegedly) doesn't go with orange. I chose purple. You don't see a lot of orange and purple together, which is a real shame. Orange and purple were two of my three wedding colors and they looked great (if I do say so myself). Anyway, here is the orange and purple gift bag I stamped. Any guesses as to what I used to do the stamping? If you guessed empty tape roll, old sponge dauber and drinking straw, you would be correct! You know what they say: one man's trash is another man's treasure. Why spend money on circle stamps when these are free and just as cute? I used two of these (tape roll and straw) for the Girl Scout cookie box makeover that I showed a few weeks ago. 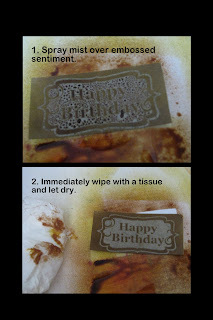 For the full tutorial, go here: Found Object Stamping. For the "Dumpster Dive" challenge, we had to turn something we would usually throw out into something beautiful. I remembered that Pamela #8040 had made a card using the patterns on the inside of security envelopes. I decided to do the same. The patterns I found were very interesting. I thought they'd make a great sympathy card. From trash (well, recycling actually) to treasure! As I've mentioned before, I am a huge fan of online crops, especially the ones at Fiskateers. Part of what I love about them is that there is almost always a teaching component. I learn so much from participating! The Fiskateer Spring Stamp Out just wrapped up. It was all about stamping, which is one of my weaker areas. I have done a bit of stamping over the years, but I still have so much to learn. I completed all 17 challenges, which included 2 games, a photo, and gallery hopping.. so a total of 13 projects. Today I'm going to share 6 of those. I completed the "You Shine" challenge first. It was very straightforward- stamp on a shiny surface and/or add shine via glitter or embossing. I used StazOn ink to stamp on a metal tag, then used my beloved Prismacolor markers to color in the gift. I added Stickles over the pen for a final bit of shine. Next was "Tag You're It." The instructions were very simple- stamp on a tag. First, I stamped the sentiment in black. Then I stamped the curly shape with Versamark and used four colors of chalk. The colors are more vibrant in real life than in the picture. They're Lego colors. I'll be adding this tag to Trevor's gift at his Lego party. The "Numbers and Letters" challenge gave me the perfect opportunity to use a background stamp I've had forever but have never used on a card. When I first got this stamp many years ago, I didn't know how to ink it. I'd always assumed you had to have a larger inkpad than your stamp (which I didn't). Now I know that ink-to-stamp is far more effective than stamp-to-ink and eliminates the need to have gigantic inkpads. For the "Let's Get Techy" challenge, I tried a technique I've never done before: second generation stamping. It took me a few tries to get the hang of it and create something I liked. I was going to add a sentiment to the front, but I decided that I like it the way it is with just a sentiment on the inside. I have such a hard time making sympathy cards! My goddaughters' baptism was a year ago Tuesday, so I made them cards to mark the occasion. I wanted to make cards that were different from last year's (which you can see here) but still baptism-appropriate. The "Wall Flower" challenge had us stamp spring flowers and color them in. Nothing says spring like daffodils! Once I had two nice images, I colored them with Prismacolors. I love how these turned out. The "3...2...1..." challenge was the toughest one for me. 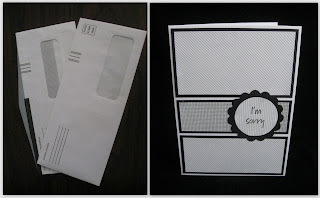 3 embellishments, 2 stamps, and 1 punch... all on one project. I struggled with how to do all that and still make a project that I liked that was true to my style. I started with the two stamps and one punch, as that was the easier part. I stamped the sentiment and punched out a circle around it. Then I stamped the cake and colored it in. Then I stopped and stared at it for awhile. Six super fun projects! Tomorrow I'll share a few more. This month's Fiskateer Color Challenge asked us to make something using complementary colors- that is, colors that are opposite one another on the color wheel, such as red/green, purple/yellow, and blue/orange. Interestingly, when I looked through my stuff for examples of other complementary color combinations, I found almost nothing. There were a few red/green Christmas layouts, but no other use of those two colors together. There was a single purple/yellow project, which was from a previous Color Challenge and not something I would have ever made on my own. Have you made projects using complementary colors? I joined the local chapter of the International MOMS Club when Trevor was 3 weeks old - definitely one of the best decisions I've ever made. I went from being a new mom with no clue, nothing to do, and no local friends, to having a dozens of local friends with kids the same age as mine, friends with older children who provided me with advice and hand-me-downs, and playgroups and activities five days a week. It's been awesome. With Trevor in school five days a week now, I'm not nearly as active with MOMS Club as I used to be. (I still try to go to as many things as I can. I'm the coordinator of our kindergarten-age playgroup, plus I coordinate the monthly brunch for moms with school-age kids.) 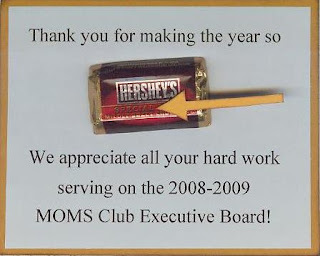 For three years, I was on the Executive Board- Secretary in 2007-2008, then President from 2008-2010. Part of my job as President was to make (extremely) inexpensive appreciation gifts for our volunteers (usually around 12 women), outgoing Board Members (5 women), and incoming Board Members (5 women). As I was chatting at the park last week with members of the current Board, I realized I've never posted the appreciation gifts I made. I don't have pictures of everything (what was I thinking?! ), but I'll share what I have. And here are the gifts. 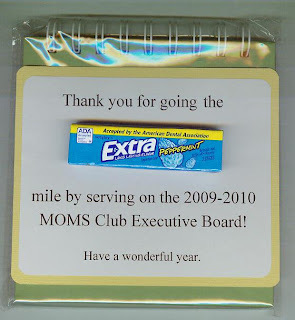 These say, "Thank you for chipping in to help make MOMS Club great!" and inside was a bag of chocolate chips. The following year, each volunteer got a small container of hand sanitizer. The tag says, "You deserve a (hand). 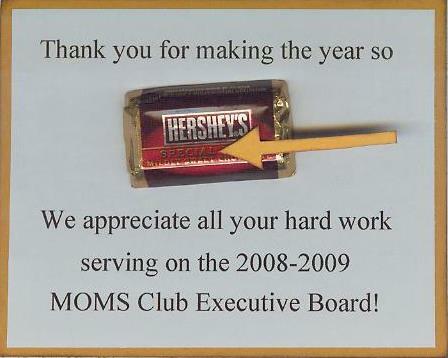 Thank you for all your hard work to help make MOMS Club so great!" 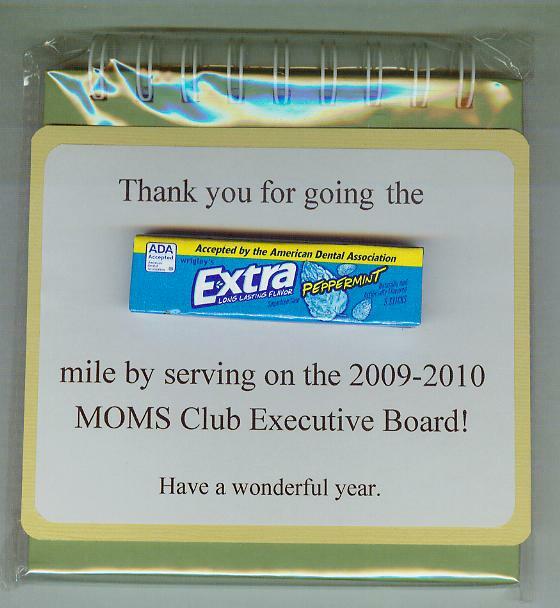 I'm looking forward to seeing what this year's Board gives to the volunteers! To be fair, we did ask why he was named Trouble. All the other rabbits had human names- Grayce, Timmy, Joey, etc. And then, Trouble. The fine women from Contra Costa Rabbit Rescue assured me that he was just more curious and active than average- definitely not trouble. When we brought him home, he was definitely active and definitely curious. In my first blog post about Trouble, I said he reminds me of a silent toddler - bursts of high energy with naps in between, into EVERYTHING, and riveted by anything new or different. For the first few months, he caused absolutely no trouble. ... one day, about 4 months after we brought Trouble home, I dropped Trevor off at school, came home 15 minutes later, and discovered a significant pile of carpet bits on the hardwood floor beneath the stairs. Bad bunny! A few weeks after that, Trevor and I put out Halloween decorations. We didn't realize that Trouble would climb the stairs, squeeze his head through the railings, push the decorations to the ground, and race down to investigate. Before I knew what had happened, Trouble had eaten the stick arms and the plastic eyes and carrot noses off the decorations. Sigh. Not too long after that, Trevor left a library book on the couch. Later that day, I heard a strange noise and found Trouble on the couch, gnawing on the library book. Bad bunny!! We learned our lesson. Fortunately, it was only a $4 lesson, as I caught him before the book was too badly damaged. And that's it. In the 11 months we've had Trouble, he's only caused trouble a few times. 99.9% of the time he is a perfectly behaved bunny. He ignores cords, doesn't chew baseboards, has never gnawed on table/chair legs, and uses his litterbox without fail. He knows which areas of the house are off-limits to him. (This doesn't stop him from going in those areas- it just means that when he goes in a forbidden area, he sneaks over and nudges one of us to let us know he's there. Then he zips off to explore. It's actually pretty funny.) All in all, he's totally awesome. And adorable. Here's another layout I made recently about Trouble. When we first brought Trouble home, we never saw him sleep. He would hide behind the couch or in his igloo to nap, leaping up if any of us entered the room. Eventually he became comfortable sleeping around us, but he still wouldn't let me get close enough for a picture. Then one day I saw him sleeping under the piano. I grabbed the camera and got a picture. A picture of a rabbit who trusts and loves us. The layout is based on this sketch by Shannon White. It's hard to tell, but I included all of the elements on my layout. I used vellum for the various shapes. Unfortunately, vellum doesn't scan well. But there's nothing like it for creating a page with a soft look. Any rabbit owners or lovers out there? Have I convinced anyone to consider adopting a rabbit? I hope so! Rabbits are awesome. I am a HUGE fan of the county fair. Growing up, our whole family's schedule revolved around the fair. I grew up entering dozens of items in the fair each year - baked goods, arts and crafts, woodworking, preserved food... and the list goes on and on. My first paid job was as an Exhibits Worker at the fair. Over the years, I continued to enter my stuff in the county fair. I entered my students' work in the fair and took them to the fair to see their work exhibited. Eventually I was asked to be a judge at the fair. I still enter items in the fair (though obviously not in the categories I judge!). I love everything about the fair. Our county fairs are really hurting. Entries are down. Way down. Fairs are losing money and it is possible, even likely, that some of our fairs will die out in the not-so-far future. That makes me incredibly sad. Since you're reading my blog, chances are good that you enjoy scrapbooking, cooking, or kids' crafts. Perhaps all three. Did you know that you can enter all of these (and so much more) in your local county fair? How about photography? Cake decorating? Gift wrapping? Gardening? Poetry? Flower arranging? People are always surprised to hear just how many different types of things can be entered in the fair. Entering is easy. Entering is inexpensive. Entering is fun. 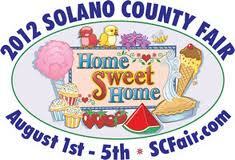 If you live elsewhere, simply Google "_____ county fair." Most counties allow residents from surrounding counties to enter their fair, so if entering in your own county fair is inconvenient (perhaps you'll be vacationing during the delivery dates) or the deadline for entries has already passed, consider entering in a surrounding county. Perhaps you're worried that your stuff isn't good enough. First of all, it probably is. Don't sell yourself short! The cards you make, the scrapbook pages you put together, the photos you take, the stitchery you do, the flowers or vegetables you grow, the cookies you bake... I'd be willing to bet there is something you've made or grown that deserves to be entered in the fair. And, to be honest, entries are down so much in some categories that there are less people entering than there are prizes. As a judge, I have awarded first place to the ONLY item entered in a category. A more popular category might only have a dozen entries, with cash prizes for 1st, 2nd, and 3rd. Those aren't bad odds. I hope all of you will consider entering something (and helping your children enter something!) in your local county fair. If you have any questions or need any help, please let me know. This is something I believe in passionately and am more than willing to help walk any of you though the process of entering. 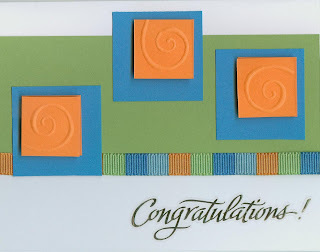 The final National Scrapbook Day challenge at scrapbook.com was a weeklong "Time Machine" challenge. We were asked to make a mini book that would serve as a time capsule to be 'opened' 10 years from now. 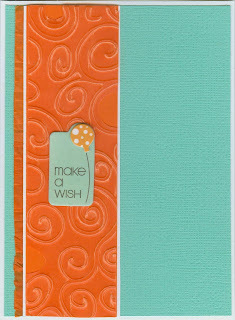 I started with the blank mini book that I made during the Kelly Purkey workshop in April. Here is the cover. I used rub-ons to put the date on the butterfly. It's hard to photograph because I embossed the butterfly, which looks pretty cool in real life. Here's the title page. Just some quick stamping and my name. Here's a page about us- our ages and a little bit about our family. A page about the fourth member of the family, Trouble. The next few pages talk about our neighborhood, daily routine, Trevor's school, annual vacations, and other things that I'm not going to post online for obvious reasons. Here's a page about my blog, which has become a huge part of my life. And finally, a totally random list of favorites. This was really fun to make, and it came together so quickly and easily. It's going to be great fun to look back on over the years. I'm thinking that I need to help Trevor make one for himself.... stay tuned!